1. Experience and expertise are important for us, but so are passion enthusiasm and a desire to learn. 2. We share a positive attitude and the desire to bring people together and provide opportunities for them to learn and grow. 3. We are committed to listening carefully, to working in teams and to promoting open, honest, communication. 1. Our schools are central, well resourced and attractive. 2. The atmosphere is professional and relaxed. We attract people from around the world who want to learn or to teach English, Spanish and other languages for a variety of reasons. 3. Our online environments, (websites, moodle and social media) bring people together, support learning and provide clear, honest, useful information. 1. Our courses are practical, enjoyable and challenging. 2. We believe our students should have the opportunity to achieve a recognized qualification to demonstrate their success in their language studies and teacher training to themselves and the world and therefore value accreditation from international bodies such as Cervantes, Trinity College London and Cambridge ESOL. 3. We are innovative and consistently seek to improve our courses, our materials and our methods based on what we learn from people we work with and developments in our field. Founded in 1998 in Barcelona and 2002 in Prague, we offer language training to the local community in those cities, including language classes to adults and young learners in our premises and off site classes in local businesses and schools. We offer teacher training courses for English teachers, accredited by Trinity College, London. We are proud of our international dimension and have associate schools in London, Kerala in India, and Cadiz and Malaga in the South of Spain. We engage with the local community in our support for charities in our annual Charity day and our ongoing work with Mental Health Catalonia. We also value the prestige of our brand. Our co-founder and current Director, Duncan Foord, and our annual Innovate ELT conference have both received awards from the industry and our team of teacher trainers includes recognized top professionals in the field. 1. When they feel comfortable and relaxed with their teacher and fellow students. 2. When they are challenged by the tasks they do in class. 3. When those tasks involve learning new language and using it in situations which will be relevant for them outside class. There are many different ways to learn a language. People can learn through self study and practice, through living in an environment where the language is spoken and through attending classes with a teacher, or a combination of these. Whichever path the learner takes, they will need to work hard and have patience. We believe anyone can learn a second language, though factors such as motivation, discipline, opportunities to practice, age and aptitude can affect how long it takes. The service we provide naturally leads us to focus on language learning through attending classes with a teacher. Our students come to us for an opportunity to practice the language and because they understand they will benefit from learning in a group of people with similar goals, which meets regularly with expert guidance and support from a teacher. It is an important part of our approach to address each student in our classes as an individual and advise and support them in achieving their goals in the language. This includes developing students’ motivation and organization and encouraging them to practice the language independently outside class, not just by completing traditional homework tasks, but also by seeking opportunities to practice the language informally with other speakers and by taking opportunities to read and listen in the language. To make sure we offer the best classes possible to students we believe in recruiting teachers who are expert users of the language they are teaching, have been suitably trained and demonstrate the appropriate skills and qualities to create classes which meet the three objectives listed above. We recruit teachers whose training includes observed teaching experience (such as The Trinity Cert TESOL/CELTA for English teachers and ELE courses for Spanish teachers. As a provider of Teacher Training courses for English Teachers, we encourage our teachers to develop their qualifications further by completing the Trinity Diploma in TESOL in house. The teacher is the most important element of the service we offer. We believe it is important to support him or her by providing suitable physical resources (such as comfortable classrooms, books, computers and projectors) and personal support through observation and feedback, counseling and advice, mentoring, meetings and opportunities to attend workshops, conferences and training courses to develop expertise. The primary challenge for our students is to communicate effectively in the language and our teachers therefore place emphasis on helping them to practice this. Students engage in communication activities which reflect the way they need to use the language outside class. For example, students will often work in pairs or small groups to take part in role plays or simulations, have discussions, recount events and so on. The teacher will give them feedback on their performance and input on vocabulary, grammar and pronunciation which will help them improve. This will include explanations of new language and written and oral practice exercises to consolidate. Classes are conducted in the target language, though teachers and students sometimes use translation where it is helpful. Teachers use a variety of materials designed for teaching from course books and internet, as well as authentic materials (from sources such as newspaper websites and YouTube), which they adapt for students. Teachers set and monitor homework tasks to complement classroom learning. This is managed through our online platform OHConnect, where students join a group for their class to communicate with their teacher and classmates, participate in homework tasks and review class contents if they miss a class. Our teachers are guided in their choice of content for their classes by the needs of the students and by established programmes in course books and the Common European Framework of Reference (CEFR). Courses are designed according to the students’ levels, needs and aspirations with the language. We offer a range of class types in English and Spanish: preparing students for official exams –Cambridge, IELTS, Trinity ISE and Trinity GESE, general language courses, courses for young learners and courses for Business English (English only). We offer a range of intensive programmes of up to 20 hours per week and extensive programmes of 3 hours a week. Students are continually assessed through progress tests and regular feedback from the teacher carried out approximately every 30 hours. Students preparing for public exams such as Cambridge ESOL or DELE are also given the opportunity to do a simulation of the actual exam. Many of our students enjoy the opportunity to meet and practice the language they are learning in the social events we organize which include language exchange nights (noches de intercambio), film nights, evening meet ups and our annual ski trip and charity day. Spanish students can participate in social and cultural activities as well as tourist excursions. Students can also borrow books and films from our library to help them practice further at home. To check we are doing a good job we get regular oral and written feedback from students and discuss this with teachers. Our Directors of Studies and marketing team manage this process with the aim of innovating and improving our classes wherever we can. We communicate with our students and potential students about our services, through images, videos and written descriptions and accounts from students on our website, social media and in social events we organize. Our admin team provides financial support and information for students, in particular processing subsidies for courses through the FUNDAE (in Spain). Our reception staff is a first point of contact for students who need information or have questions about courses and services we offer. 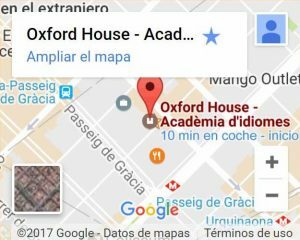 They are able to attend students in Spanish, Catalan or English. 1. Students feel comfortable with their teacher and classmates. 2. Exercises done in class which are challenging for students. 3. Tasks and language which are covered in class is practical and useful. 1. Intensive courses (32 hours a month in groups of a maximum of 16 students). 2. Super intensive courses (80 hours a month for groups of a maximum of 6 students). 3. Intensive DELE exam preparation courses. 4. Customized courses for school groups. The evaluation procedure, support and teacher development are the same as that which we have established for our English teachers. Our English and Spanish teaching staff share a workspace and resources in the school. We want to encourage communication and teamwork between them. In fact, we have teachers in our team who teach both languages. Within our teacher development program we organize mixed events (for example, chats and talks in Spanish or English) about teaching methodology aimed at all teachers, in addition to specific meetings for each team. Our team of Spanish teachers meet to discuss topics of specific interest to them (for example, evaluation procedures for our intensive courses, the challenges posed by a monthly sign-up system, and how to teach classes with students of mixed nationalities and cultural backgrounds). We have two Directors of Studies, one of whom is responsible for in-centre English courses, while the other is responsible for in-centre Spanish courses and all in-company courses (be it English, Spanish or any other language). We have a team of coordinators, one of whom is the Spanish coordinator. Our teachers are qualified, have experience teaching Spanish as a second language, and offer communicative classes based on the needs of our students.